If so you may have a condition called peripheral neuropathy. My name is Dr Saxon Selvey (Chiropractor), clinic director at Healthy Living Family Chiropractic. I’ve been helping people with neuropathy and nerve problems for 10 years. More than 20 million Americans suffer from peripheral neuropathy, a problem caused by damage to the nerves that supply your arms and legs. This painful condition interferes with your body’s ability to transmit messages to your muscles, skin, joints, or internal organs. If ignored or mistreated, neuropathy can lead to irreversible health conditions. Why not get help by those trained to correct the major cause of peripheral neuropathy? Data from the National Board of Chiropractic Examiners’ Job Analysis of Chiropractic lists arm and leg neuropathy as the second most common nerve problem treated by chiropractors. Often neuropathy is caused by a degenerating spine pressing on the nerve roots. This can happen in any of the vertebral joints from the neck all the way down to the tail bone. P.S. 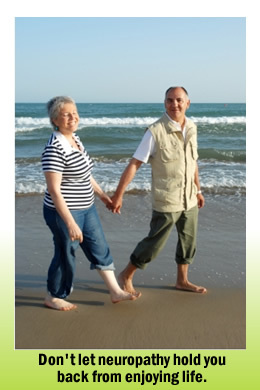 At our office, we have dedicated treatment programs for treating patients who suffer from neuropathy. That’s no way to live, not when there could be an easy solution to your problem Don’t live in pain when we may have the solution you’ve been looking for all along.